Making quality recordings and an excellent subsequent mix requires not only good microphones and recording equipment; you also need good loudspeakers known as .studio monitors, named for the fact that they are used to monitor recordings They are also used in the subsequent editing of recordings as they are mixed and finalised. To help you choose the right studio monitor, we have prepared the following advice. For your first work with recording and editing music, 20-40 W monitors sold in pairs will serve you well; one speaker is active (with a built-in amp), the other is passive (connected to the active speaker But if you're looking for a professional setup, get two identical active monitors. Please note that monitors are standardly sold separately If the picture on our e-shop shows only one monitor, there will only be one in the package. 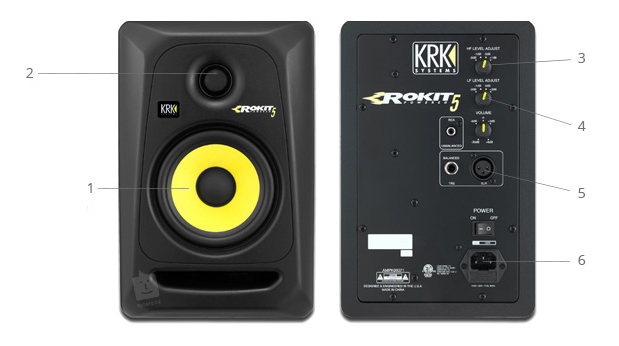 Studio monitors are the absolute standard in all home and professional studios. One good monitor will let you listen to each detail of your recording. Hi-fi speakers are definitely not suitable for work with music, as they have a tendency to emphasise certain frequencies (especially high and bass) to provide a better listening experience. Studio speakers in turn are designed to provide an 'even', neutral and balanced sound across the entire spectrum. Recording and editing music makes use of 'nearfield' monitors, which are intended for close (critical) listening. They are set on the table (typically next to the computer screen) on which the music is being edited. Today it is no longer necessary to look for a suitable amplifier, since the vast majority of monitors are active and hence have a built-in amplified As such, studio monitors are connected directly to the sound card. However, it is necessary to buy the proper audio cables. Symmetrical cables with male XLR connectors (for the monitor) with a 1/4" stereo jack on the other end (for the sound card) are mostly used today Basic monitors sold in pairs are often connected to a PC or sound card using cinch cables. If you plan to set the monitor on the table, it's best to buy an acoustic pad to prevent the whole table from resonating Except for the smallest monitors, it's better to buy a suitable stand.